Excellent CLUMPING bamboo that is adaptable to a wide range of situations. Ultimately 15′ tall the 3/4″ culms rise up green with dramatic white culm sheaths before changing to a golden yellow. The foliage is dense and clusters around the top 3/4th of the canes. 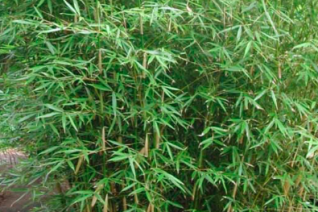 Easy to grow bamboo for redistricted sites in high overhead shade to full sun (but avoid the reflected heat of walls). Spreads moderately fast by a steadily increasing clump- each new culm is just inches from the other. Forming a grove to 4′ wide at the base in 6 years. Very upright growth makes it ideal for the thin space between houses, or for shading a courtyard. Regular summer water in rich, moisture retentive soil that drains. Drought adapted when established. Good performance in ice and snow. Hardy.